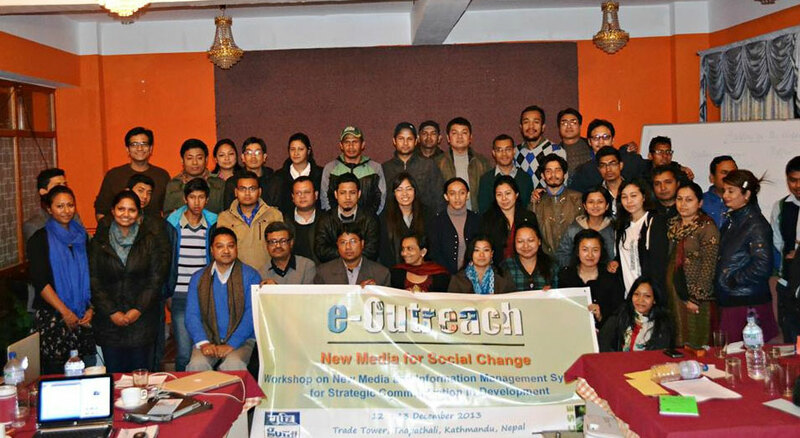 A two-day’s training workshop on “New Media & Information Management Systems for Strategic Communication in Development” held on 12-13 December 2013 at Thapathali, Kathmandu, Nepal concluded with the participants confident and committed in using social media strategically to manage information for advocacy and better outreach. Forty five participants from diverse backgrounds, representing the Ministry of Urban Development, Kathmandu Metropolitan City, Alternative Energy Promotion Centre, Lumanti Support group for shelter, Kathmandu Valley Drinking water Management Board, People’s Campus, Citizen College, Nepali Youth at Guthi and various leading media houses gained theoretical as well as hands on experience on managing the web, social media and online tools, web analysis tools and various aspects of strategic information documentation and communication. This workshop was third in the series of South Asian course on new media and information/communication systems that was conducted by CSE in New Delhi in January 2013 and at Colombo, Sri Lanka in June 2013. To fulfill specific needs of participants belonging to Nepal it was further customised with Nepalese content and resource persons. Rajneesh Bhandari, media journalist from Nepal guided the participants in creating their own blog identity, which was followed by practical sessions. He further explained how to use mobile apps for advocacy. “Pictures are the most powerful tool of advocacy and we all have smart phones nowadays, it can be best tool to click pictures. Big revolutions in Egypt and many other countries started with the pictures clicked by phone and shared in social media, that is the power of photo and social media,” he stressed. “Choose the media and network that best suits your requirement and that is most popular in your place to create the right mix for better outreach,” was the clear message from Ravi Bajpai, web and new media strategist at CSE. He stressed that right time and consistent effort is required for the better outreach in the social media. “However there is no tool that can provide you popularity if you do not have good content,” he stressed. The session on significance of data journalism for e-engagement by CSE, that introduced participants to open-source tools for creating infographics, maps was found to be very useful amongst the group and most of the participants were able to create their own tables and maps at the workshop. Kiran Pandey, Programme Director, Knowledge Portal & Information Management at CSE presented the case study of “Down To Earth (http://www.downtoearth.org.in)” online magazine focusing on experiences and learnings on social media in the program for better understanding of the participants. CSE also launched the South Asia Environment Portal (http:/sa.indiaenvironmentportal.org.in) during the event and the participating organizations committed to contribute for its content. The participants were informed about the variety of information and knowledge that exists on this portal and the South Asia Environment & Development Network - the online community of institutions, environment experts and industries working on environment and development in the region. The program concluded with distribution of certificates to the participants.